Well folks, we’ve successfully completed our Rhythm Road tour and boy has it been a life-changing experience. We are just now sitting down in the hotel to have a beer and reflect on the last five weeks before we travel back home tomorrow. The past couple of days in Seoul have been so full of action that we’ve hardly had any time to write down our thoughts, but I’ll try to do my best to sum it all up. Yesterday we had an amazing exchange with some phenomenal Korean traditional musicians on the lawn of the Ambassador’s residence here in Seoul. The residence is the oldest foreign owned property in the country, which is a testament to how strong the connection is between our two countries, and I am honored to say that we all feel like we are part of that relationship now. We got an opportunity to ask lots of questions about the Raga-esque forms of traditional Korean music and eventually we were able to join in and play with them. They were some of the most incredible musicians we came across on the tour and they quickly latched on to our music and played along with us as well. Afterward we all had an incredible lunch inside the Ambassador’s house and we left completely satisfied both musically and culinarily. We then went down to the TBS radio station (the english-speaking channel here in seoul) and played some tunes and answered some questions on Steve and Sam’s show. Even though we were running late because we did not want our exchange with the Korean musicians to end, we got into the studio just in the nick of time and had a great time playing live on the radio. After a few hours of freshening up, we went down to the Chonnyon Dongan Do (“For a Thousand Years”) one of the most famous jazz clubs in downtown Seoul to play a concert. Although we didn’t know what to expect from a jazz-loving audience, they were very lively and seemed to love the Earth-string sound. They especially enjoyed “You Are My Sunshine” and “The Tennessee Waltz” which are both very popular songs in Korea. 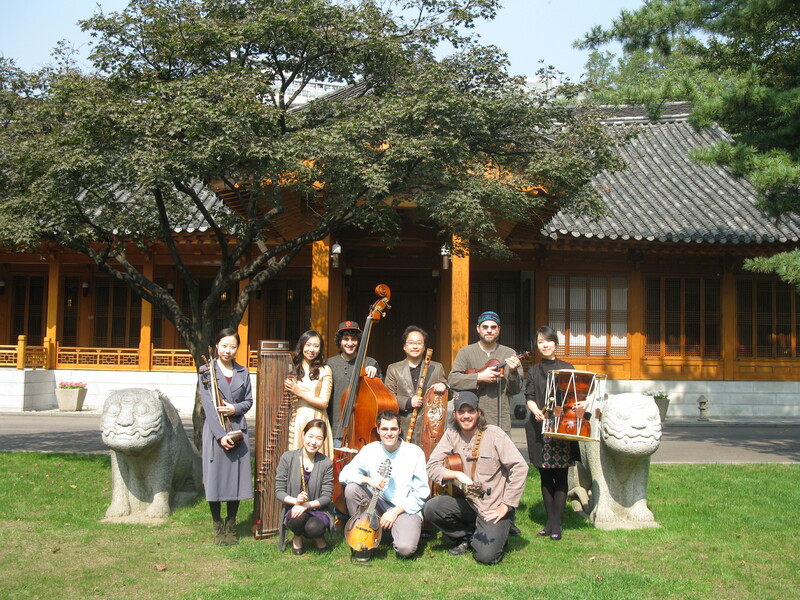 Today was another full day of music, and it started with a performance at the Korean National Folk Museum. After getting to check out some of the galleries, we played in the front hall of the museum for anyone who wanted to listen. We had a terrific audience and everyone seemed to really enjoy hearing bluegrass and old-time music for the first time. This Evening we had our final performance at the Seoul Dream Forrest and it was truly a special one. We played for 90 minutes and really got to finish out the Rhythm Road with a bang! We dedicated our performance to Daniel Pearl and Eric gave a heart-wrenching rendition of his beautiful original gospel tune, “Take Me Under.” It was a great vibe getting to play our final show for lots of happy families picnicking under an almost full moon, and it was an experience I’m sure we’ll all remember for a long time. We appropriately played the oldtime tune “Goodbye Girls, I’m Goin’ to Boston” as well as the Wood Brothers’ “One More Day.” The audience response might have been the warmest of the whole tour and everybody was feeding off of their energy. Although it is a little sad that we are finished with this epic journey, we are all ready to go home and be with our friends and family, and we are honored to have been a part of this incredible experience. We would like to give a very special thanks to Brian, Yoon, Maria, and Dae-Yun from the U.S embassy here in Seoul, and our amazing drivers Mr. Jeong and Mr. Che for making our experience here in Korea truly spectacular! Andy here for a quick update! The tour is nearing its end, and The Earth Stringband is still cranking out tunes harder than ever! Our schedule has been so full of playing and traveling it’s been hard to post as often on here as we’d like! Yesterday in Youngdong, we played at the epic Nangye Traditional Music Festival. I had a chance to sit down and do some tuneswapping with the local musicians, alongside with the DCM (2nd in command to the Ambassador) of the US to South Korea, who had spent time here learning to play the Gayageum. Today we did a recording for a studio audience back in Seoul… meaning Koreans in the present and future who were unable to see us live will be rocking out back in their own homes! On another foodie note, they make an incredible drink here called Makgeolli – an unfiltered rice wine very low in alcohol with a ridiculous amount of yeast left in to shake up. Great source of vitamin B! It’s funky and delicious. The next 2 days hold plentiful gigs, and we are so excited for them, but, we are feeling the wear and tear of the road and we can feel our long flight back to the US looming. Until next time, check out this unbelievable video of HoJoon Lee playing a tune he showed me on his gayageum! Come! Up go, let’s play! 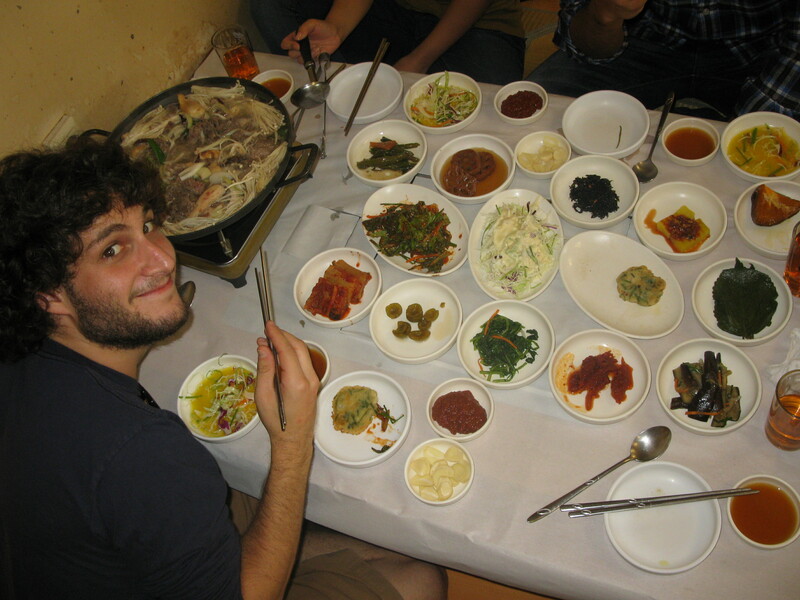 Andy here – yesterday we left Seoul to travel south to Jeonju for the Jeonju International Sori Festival. Beautiful mountains, countrysides, and big apartment buildings flew by as we zipped across the country. We arrived at a traditional Korean residence, where we sleep on mats on the floor under pagodas. After a quick change into our swank gig clothes, a quick drive to the festival brought us to an epic amphitheater area with steps that seemed designed to make you fall if you’re not looking. 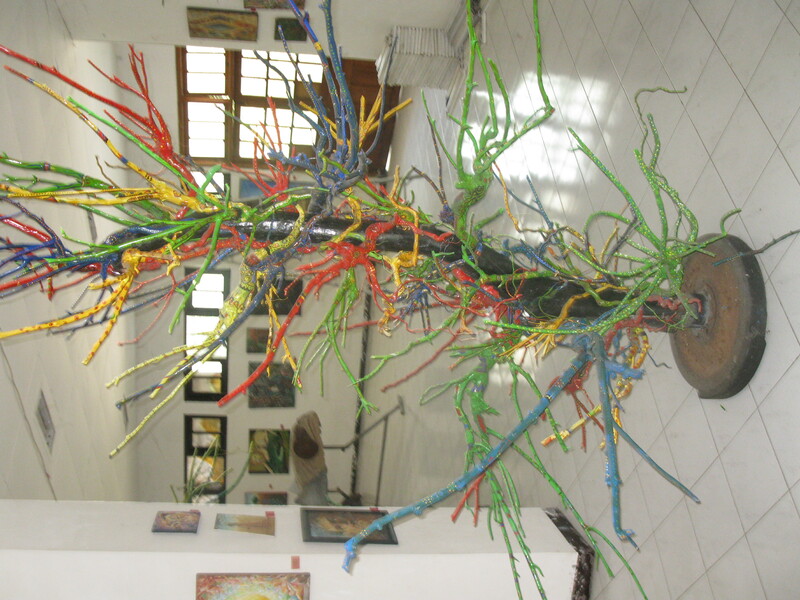 The theme of the festival was “Come! Up go, let’s play!” which is apparently a very clever play on both Korean and English words. 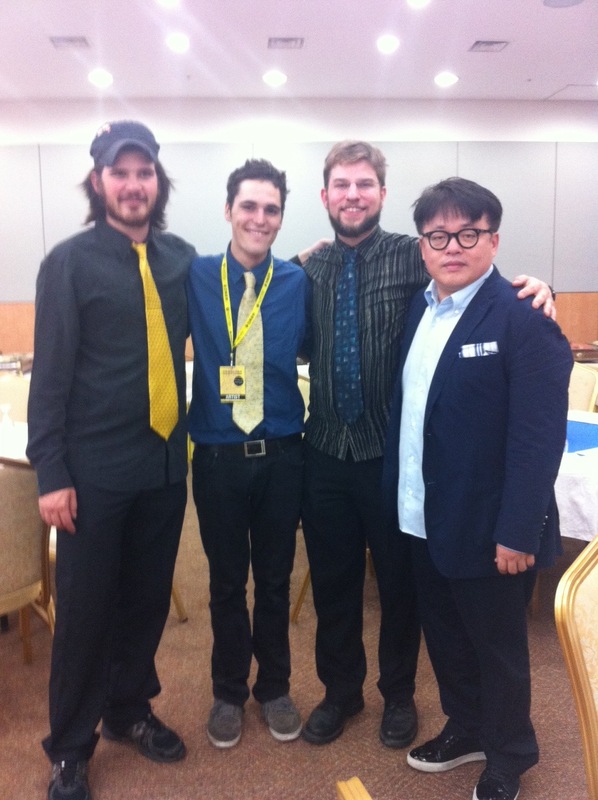 We had a great tent area to warm up and get our instruments out, and were able to meet with Kim Hyung Suk, a producer, composer, film-scorer, one of the chairs of the festival, and THE K-Pop Wizard! He was a great vibe and we really enjoyed talking to him about music and the music business. After a sweet jazz orchestra, we played one set and had a ridiculous amount of fun playing with all the positive energy flowing back at us from the audience. After our set, a saxophone group was followed by a beautiful collection of traditional Korean musicians, playing a combination of bowed strings, plucked strings, flutes and buzzing reed instruments, guitar and drums. Their musical interactions were transfixing and they sat in a semi-circle, legs crossed, creating quite a spiritual vibe. In a nearby theater, a huge production of a folk story, done in a new way, infused korean trad. music and dance with a pop band and orchestra of traditional instruments. This featured incredible expressive, gritty, soulful singing, and epic dancing, characters, and a sensory overload of fog, lights, sound. One of the singers was a national treasure, and it was truly a pleasure to see this performance. Exiting the theater we were greeted by a traditional Farmer’s dance music parade featuring drums, gongs, flying streamers and incredible costumes. For me, it seemed highly reminiscent of the Banished Fools parades in Providence over New Years! As the group worked its way down the steps towards the stage, they began circling in a giant pulsing ball of incredible energy and some of the crowd including us made it down and danced with all of the performers. As we were catching our breath, one of the most amazing fireworks displays I’ve ever seen shot off of a nearby roof. Are you kidding me? This was an amazing experience. As if the arc of the night couldn’t possibly get more insane, the festival after-party featured delicious food, and super loud cheers we couldn’t fully comprehend, though we appreciated their enthusiasm! The vibe was celebratory as all of the volunteers made the whole festival possible and we can’t thank them enough for their help. On the spur of a moment, we grabbed our instruments for a raucous acoustic encore and that rounded out the night for us to return to our comfy pagodas. Today was a great day for food – we got up early for traditional Korean breakfast of rice, spicy beef, kimchee, fish, fermented miso soup and a more! Lunch was a vast array of the most dishes we’ve seen put on a table so far with bulgogi – marinated beef with mushrooms and onions as the centerpiece. 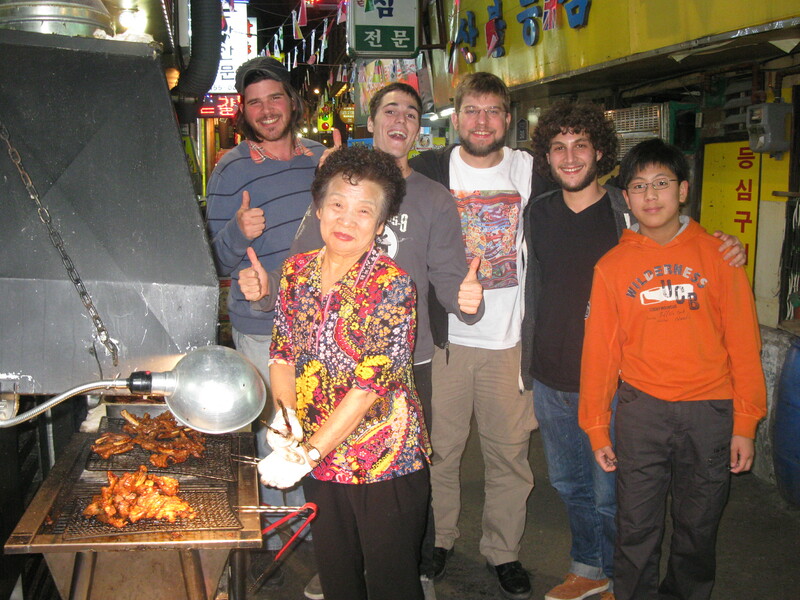 We followed all the amazing food with a cultural exchange where we listened to music from Ladies and Gentlemen, a Korean Indie-Rock band, as well as their fusion with traditional music. We shared our music and then listened to an unbelievable Gayageum player, who taught us Arirang – a popular Korean folk song. What a day what a day! I’m sitting here in our little pagoda village with Stash and Eric, editing videos and writing this post. I hope you enjoy! 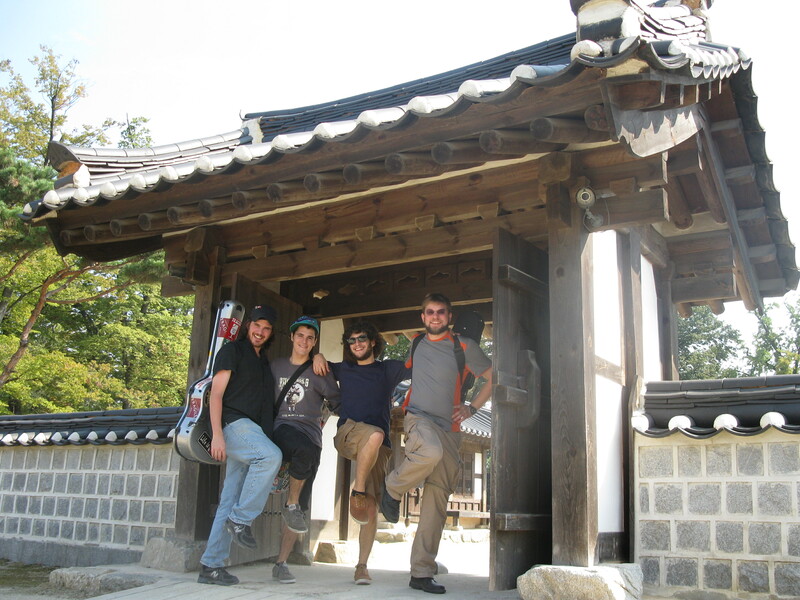 South Korea, The Earth Stringband’s final frontier. After a grueling day of travel from Timor Leste, we finally arrived at South Korea’s Incheon airport at 6 am in the morning yesterday greeted by our friendly assistant regional program officer, Yoon. We arrived to the Westin hotel in Seoul that morning and all went our separate paths until the afternoon. 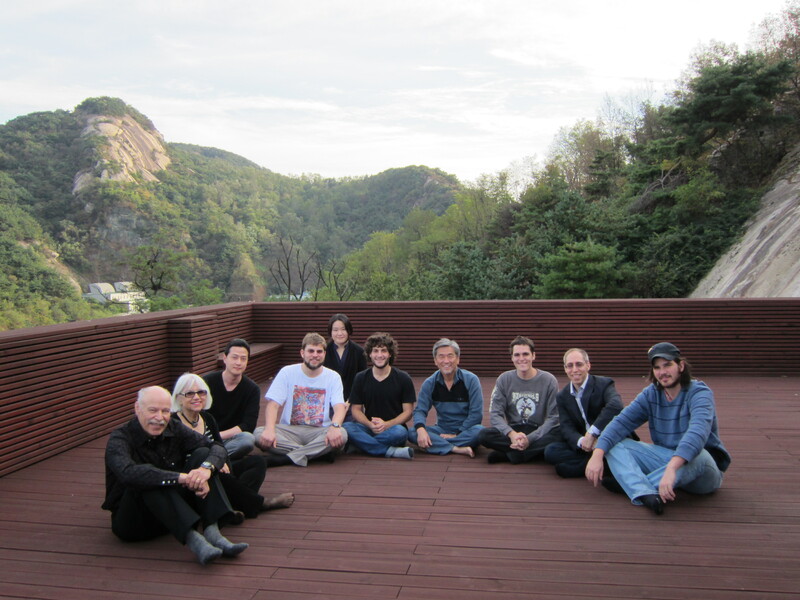 We all took a trip to Jang’s house which was built into the mountains in a beautiful part of Seoul. 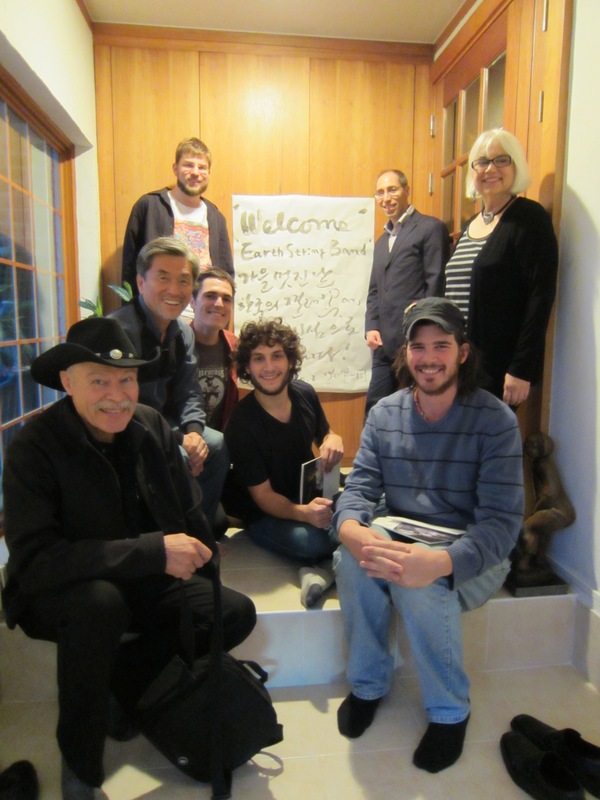 We were greeted by a very smiley, warm and welcoming Mr. Jang who ushered us into his house beaming with joy and delight. He showed us up to his amazing balcony spot on the top floor where one could see beautiful mountains all around and distant remains of ancient palace walls. It was immediately apparent that nature is a very big part of Mr. Jang’s being. The way his house blended into the city scenery was uplifting. Mr. Jang’s home is the first house aside from ambassador residences that the Earth Stringband has been able to spend time in since we started touring. Even though we love to tour, The Earth Stringband loves the smell and feel of a nice cozy home. With the help of Maria translating for us, Mr. Jang talked to us about his music and his philosophies. He showed us his collection of Gongs and gave everybody in the band a nice piece of percussion to bang on for a while. We had an awesome jam, some of which was captured in the video below. I was exposed to the awesomeness of a gong jam a few years ago by our good friends Chris Turner and Rachel Maloney so the vague notion of jamming on gongs again perked me up from my semi-jetlag state after the flight from the night before. Midway through the jam I had a realization of how dissonance and “out” music occurs so much in nature and in the most rootsy un-intellectual of ways (when talking about something sounding “out” I’m just referring to something being out of the normal way we hear things tonally. Studying at music school, the notion of playing “out” music often gets very intellectualized and sounds and feels more like math than real music in many circumstances). In the same way you hear dissonances and crazy harmony coming out of gospel music when the spirit is coming through the church, I could feel the spirit coming from Mr. Jang as the gongs were swirling with his voice. Mr. Jang then sat us down for some tea and talked to us about how he lets nature inspire him and how being in his home and being able to look at the sky and breathe the good Seoul air keeps him going everyday and keeps his music and art flowing at all times. He is a very busy man and it was such an honor to have tea with him and hear his stories and perspectives on life. I can’t thank the embassy here enough for scheduling this awesome interaction for us, especially considering how busy Mr. Jang’s schedule is. In a change of pace, after Mr. Jang’s house, the embassy van jetted us off to the Korea Heritage Fashion Show incorporating traditional Korean fashion into modern interpretations of fashion. 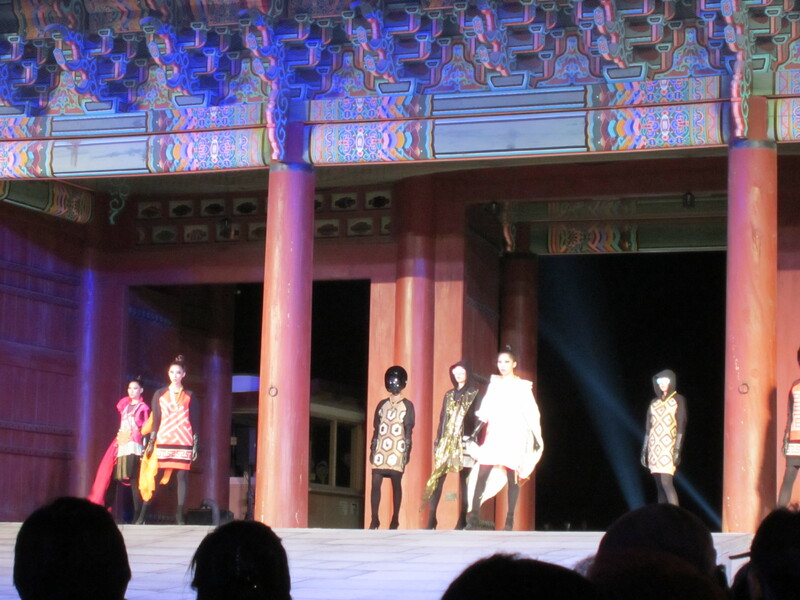 The embassy managed to get us VIP seats and we were seated in the front rows at one of the biggest imperial palaces in Seoul for this amazing display of fashion. Needless to say, we were all extremely under-dressed in our plaid shirts and jeans, but nobody seemed to mind too much. I’ve never been to a fashion show so this was a serious trip for me. All the models with their uber-hip clothing from a future dimension would stoically walk down the walkway in perfect lines. It was amazing watching those guys and girls keep a straight face for that long with clothes that fit them perfectly well. The music went amazingly well with the show and included both a band with traditional and modern instruments and a pre-recorded soundtrack that blended with the live musicians’ repertoire seamlessly. 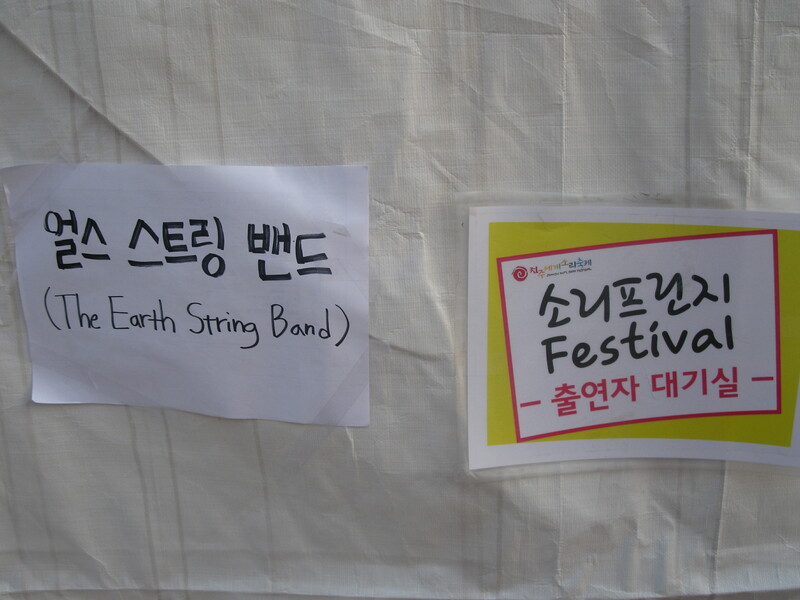 Day 2 in Seoul was the Earth Stringband’s shopping day. We ate amazing vegetarian temple food in the downtown area for lunch and then went around the different markets shopping for souvenirs and appreciating the smells and tastes of Seoul. The city has so much character and so many cool little things that represent that character. The food is rich and all the colors you see are full and vibrant. Shiny things are really shiny, and tasty things are rich and yummy! We ended the day with one of my fathers’ physicist friends, Inkyu, from the University of Seoul taking us out to a traditional meal of hot Korean BBQ and kimchi and squid pancakes after. Hot Korean BBQ (different than traditional Korean BBQ) is everything it’s hyped up to be. We met the woman at the restaurant who allegedly created the incredible sauce popular in the district that the ribs are seasoned with. She was outside grilling those ribs up just right for everybody. All the little side dishes were delicious and without a doubt were the best pork ribs I’ve had in my life. 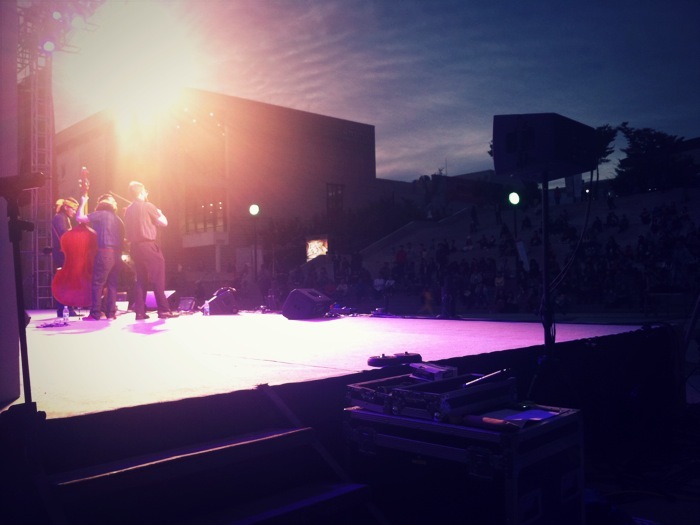 Tomorrow we go to Jeonju to play at the closing ceremony of the folk festival there and we resume our musical work. Thanks to the embassy and our friends here in South Korea, the first 2 days here have been incredible and a true cultural immersion for the Earth Stringband. I can’t wait to see more music, meet delightful people, and eat delicious food. Aansanghaseyo! 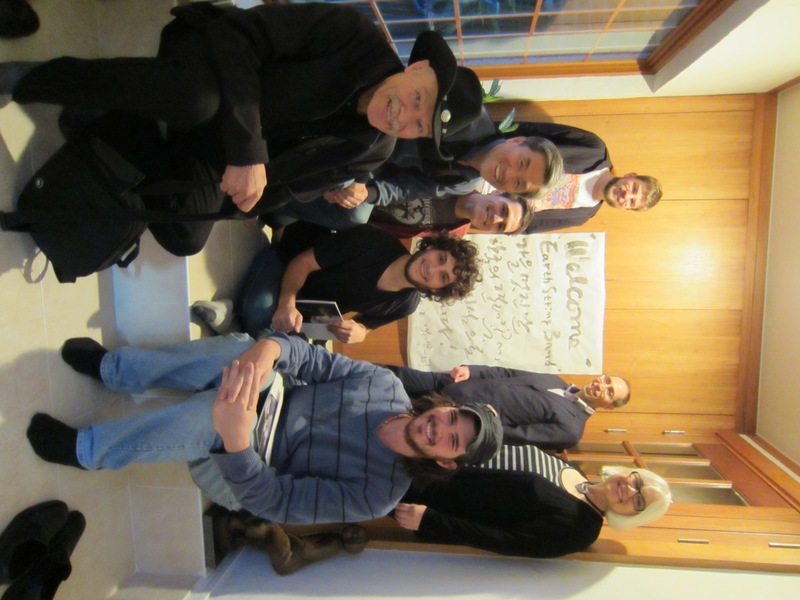 We arrived at the grounds and were very warmly greeted by the whole crew. After getting our sounds right through the PA system, we decided to ditch the microphones and jump down to play some tunes acoustic, up close and personal. After kicking into the first song one thing became very clear watching their reactions- these guys could GROOOOOOVE. The overall energy of Timorese seems to be very raw, loose, and rhythmic, so after we finished our little set we were ready to hear some traditional Timor songs and JAM. To make the vibes even sweeter, about 15 itty bitty kids from the International School came to get down to the music just before the jam started. I’ll let the video speak for itself. 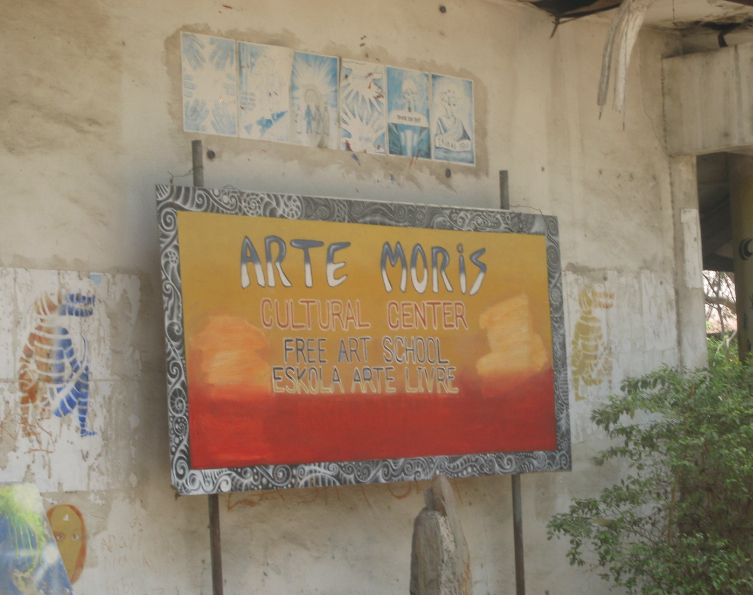 We were given a great tour of the whole Arte Moris before we left, including amazing galleries and exhibitions, living quarters, and library/ media room, an office, music and jam spaces, and living quarters. By far one of the coolest places I’ve been in the world so far. We finished off our Timor-Leste run with an evening performance at the Sunset Fair, a wonderful weekly happening here in Dili complete with hand-crafted goods vendors and an assortment of delicious food, including Kangaroo (we sadly didn’t get to try it). We ended our set in the appropriate Earth String Band style- joined by five guys from Arte Moris playing a couple of their traditional songs and one of ours. The crowd went nuts. We all retired back to the beach after the show and continued to play music all night, I’m gonna miss the guys! 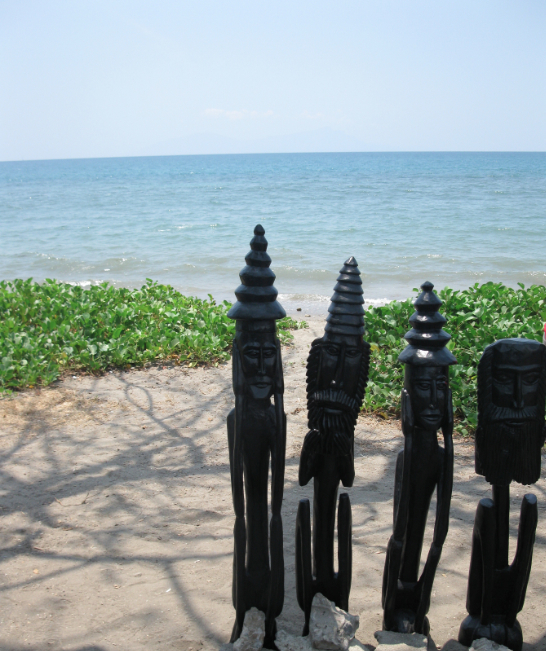 Timor-Leste, beautiful people and a beautiful landscape, truly a hidden gem of country. Now off to South Korea! 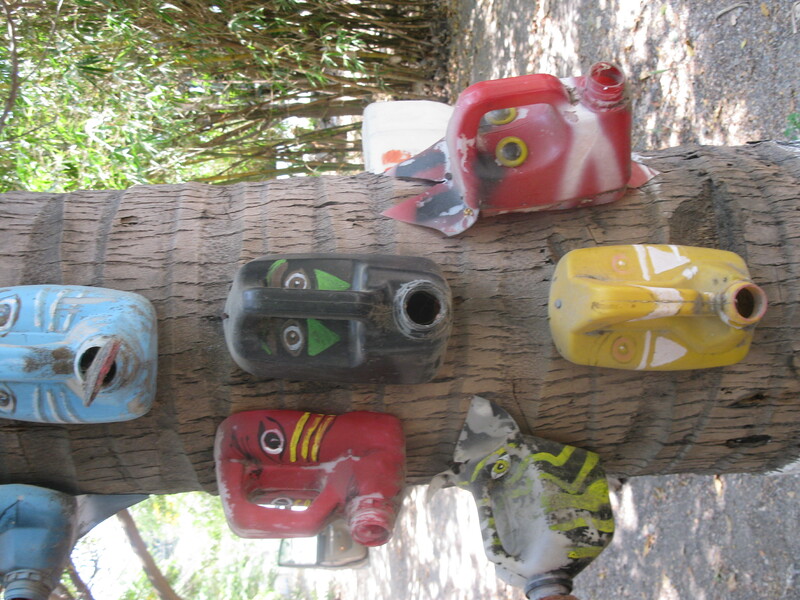 This is Sam checking in from Timor-Leste. Today was our second full day here in this beautiful, sunny country, and after a late wake up call we had a full day of music ahead of us. 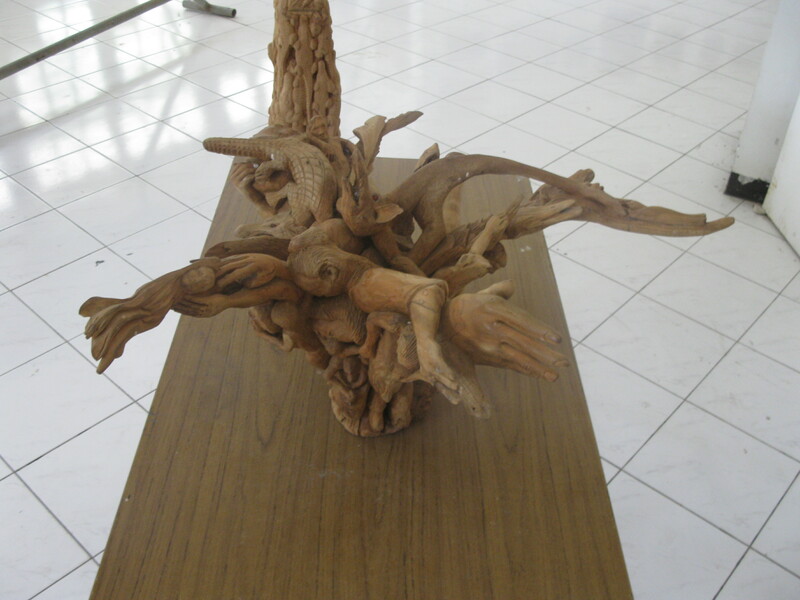 After all us boys went out for lunch at the Castaway (our favorite ex-pat-friendly restaurant here in Dili) we came across a local artist selling beautiful handcrafted wooden sculptures and each picked out something to bring back to Brighton. We then went back to the hotel and worked up some fresh new repertoire and geared up for our concert at Colegio Sao Jose, a high school here in Dili. The energy that we felt from the kids at Sao Jose was absolutely incredible! Even though they were sitting down, the 200 or so highschoolers really got into the vibe once they heard some good ol’ stringband music. The entire time we played the kids were smiling, screaming, and throwing up devil horns and we all had a great time pickin’ and singin’ for everybody. 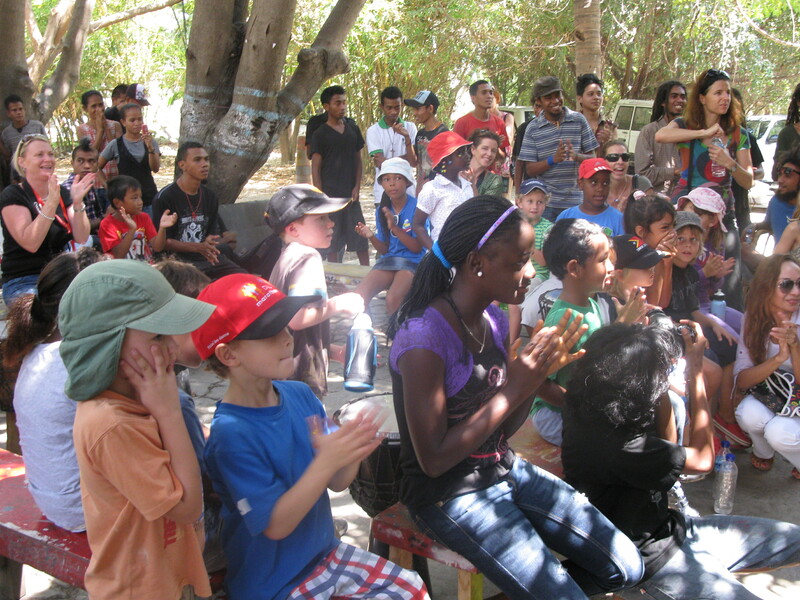 Once we finished our performance some students presented us with traditional Timorese ties and we spent some time passing out Lincoln center swag, signing autographs and taking pictures with everyone before we had to rush off to the next gig, a concert at the International Stabilization Force compound. Playing for the Aussie and Kiwi soldiers at the ISF was a great experience for everyone and also our way of saying thanks to all the men and women who sacrifice so much to serve their countries. We also had the privilege of eating with Glenn, a 32-year veteran of the Australian army. 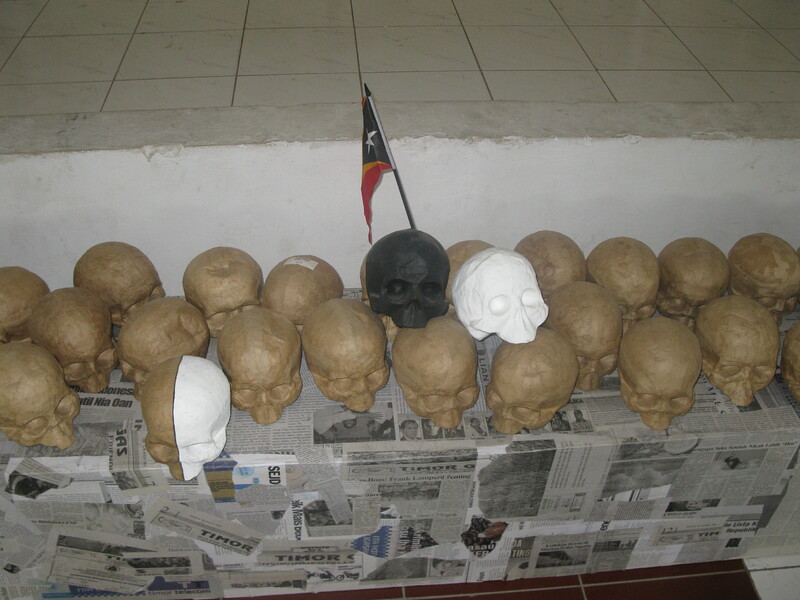 Not only was the food some of the best we’ve had in the country, we got to pick Glenn’s brain about the military history of Timor and life at the ISF. We played a concert on the back of a huge truck in a hanger on the base, and got to play Soldier’s Joy for an enthusiastic group of Australian and New Zealander soldiers. We had a great time getting to meet lots of the folks at the ISF after the gig and even though we couldn’t bring them any beer (most military bases are dry, and most military folks would love the occasional brew) we were glad to be able to bring some music and provide a little entertainment. Although we’ve only got one more day here in Timor, we’ve got another full day ahead of us tomorrow so I’d better get some shut-eye! 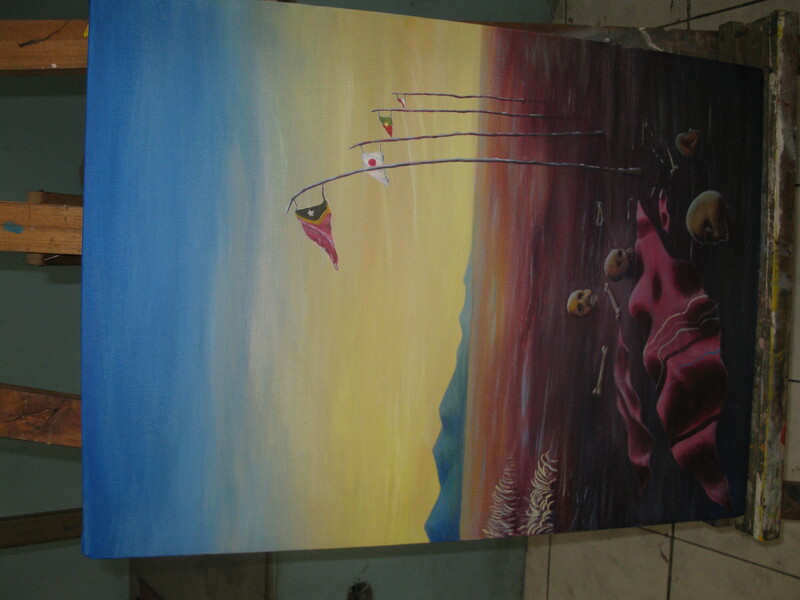 Today, we woke up in Timor-Leste, the youngest democracy in Asia. Epic vistas of mountains greet the ocean in a sweeping, beautiful way as they both meet the pure blue sky. As opposed to our experiences with monsoon season in Laos, Thailand, and Cambodia, here it is hot and sunny with very few clouds. In fact, it hasn’t rained since June and the locals don’t expect any more until December. It’s the dry season here for sure. In a meeting this morning with Ambassador Fergin, we learned more about the turbulent history of this part of the island and the resilience of its people. 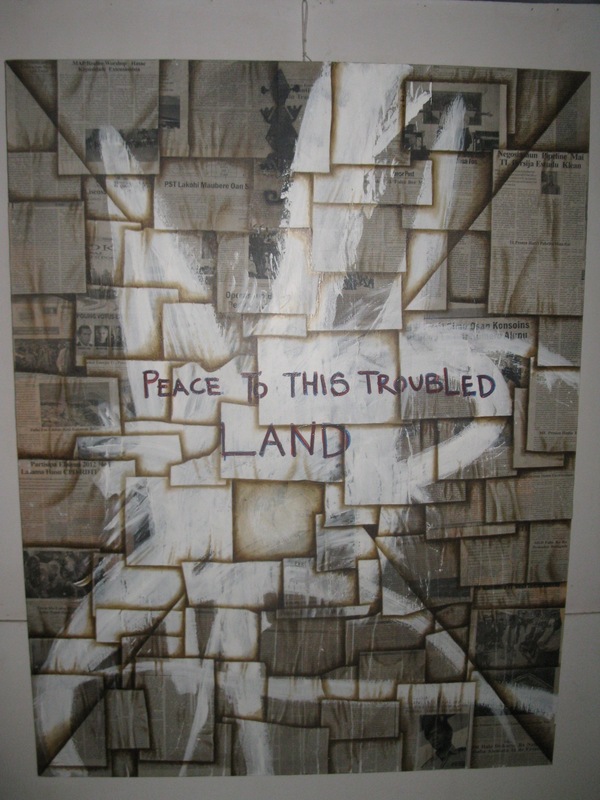 Right now is the longest period of peace in recent memory. 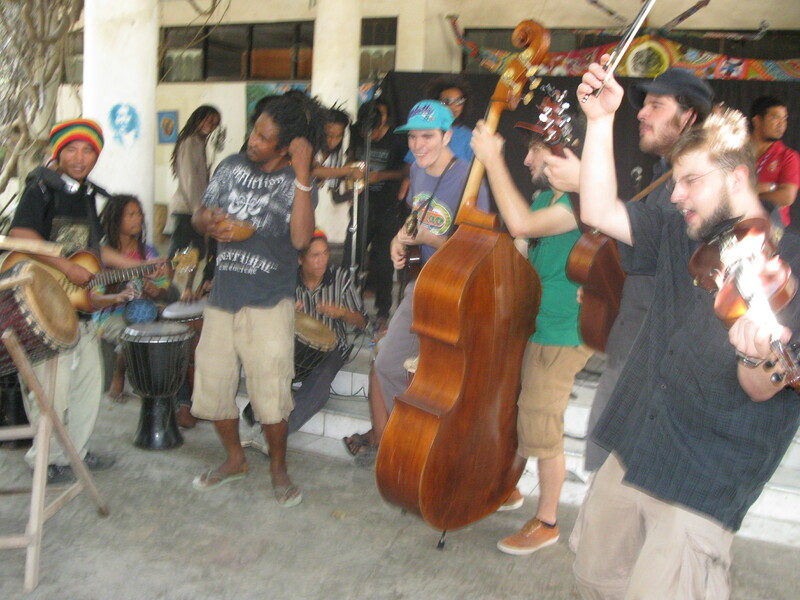 We are the first American band EVER to tour in Timor-Leste. What an honor!!! 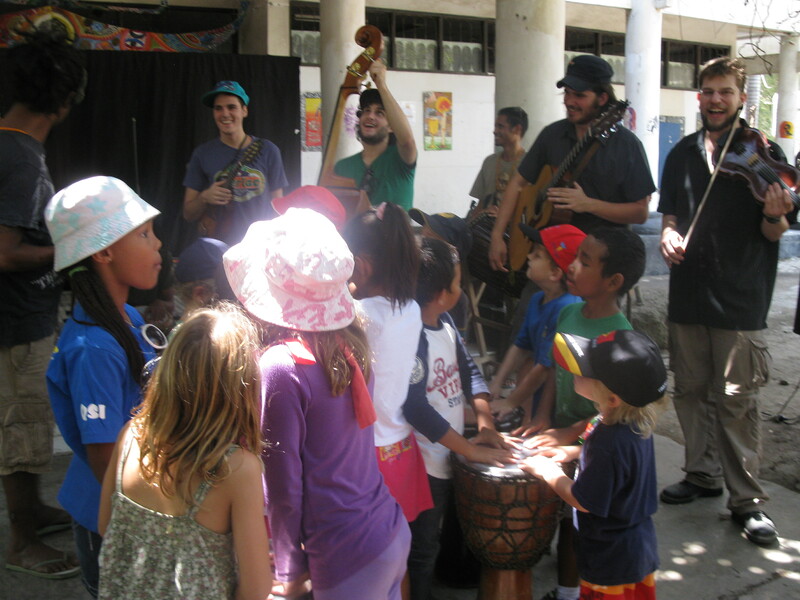 This afternoon, we played for 8-11 year olds in their schoolyard at Farol Primary School. They learn their schoolwork by ear, mostly without books. 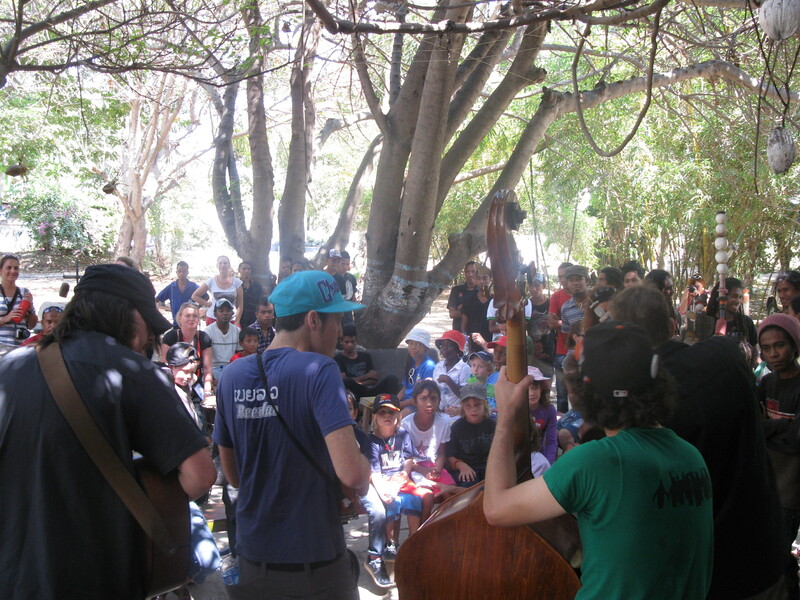 As we laid down the Earth Stringband MASH under a grass hut, reactions varied from huge smiles to groovy tropical dancing. While some preferred the scattered shade in other parts of the yard, many braved the heat to become part of the show right up front. Growing up in a new country cannot be easy, but these kids are forming their identities and they will be the future of Timor-Leste. We see strong hearts and bright futures! Once evening hit, we played a concert at Ambassador Fergin’s residence to one of the most incredible collections of people we’ve ever seen. 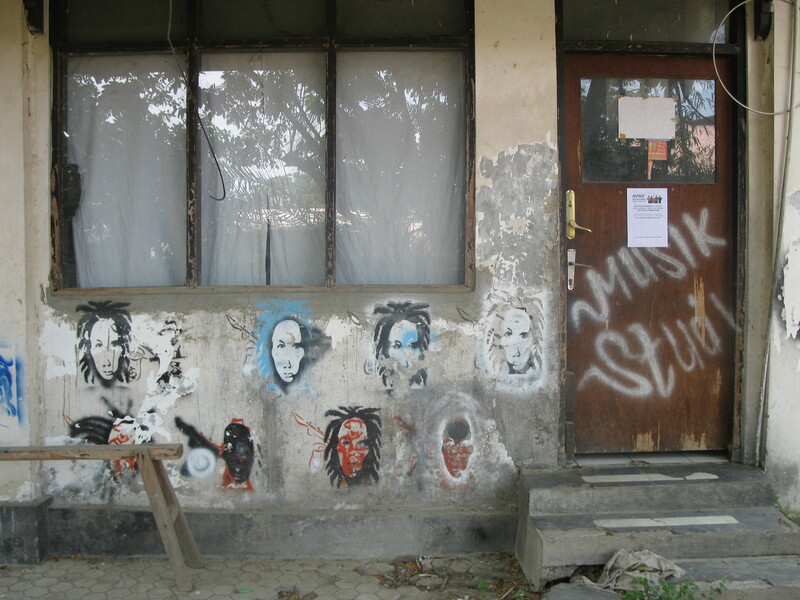 The invite list was tailored to bring mostly Timor-Leste people who are actively working for a better future in this new country and it showed; the attendees included university students who contribute to peace and stability, Rotary members (big and very helpful in this part of the world), people who work for NGO’s, student council members, artists/musicians who we’ll jam with on Friday at Arte Moris, and USAID workers. The Earth Stringband has been on tour for a while now and it’s starting to show. We’re finishing each other’s sentences in song, together in unison, and playing and listening to each other better than ever. This really translated tonight and the audience got way into our vibe. Ambassador Fergin was dancing up a storm, the Timorese were dancing up a storm, and everyone had a great time celebrating life and music and togetherness between peoples! PS. Our internet access is limited so please forgive the lack of extensive multimedia, but we’ll do the best we can! Andy here! 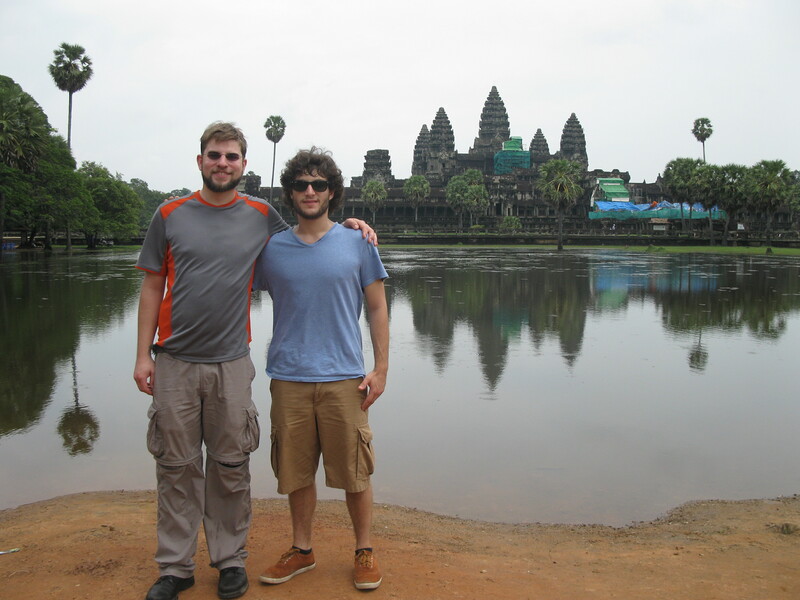 Sam and I had an epic day in Siem Reap, home to Angkor Wat and many other surrounding temples. 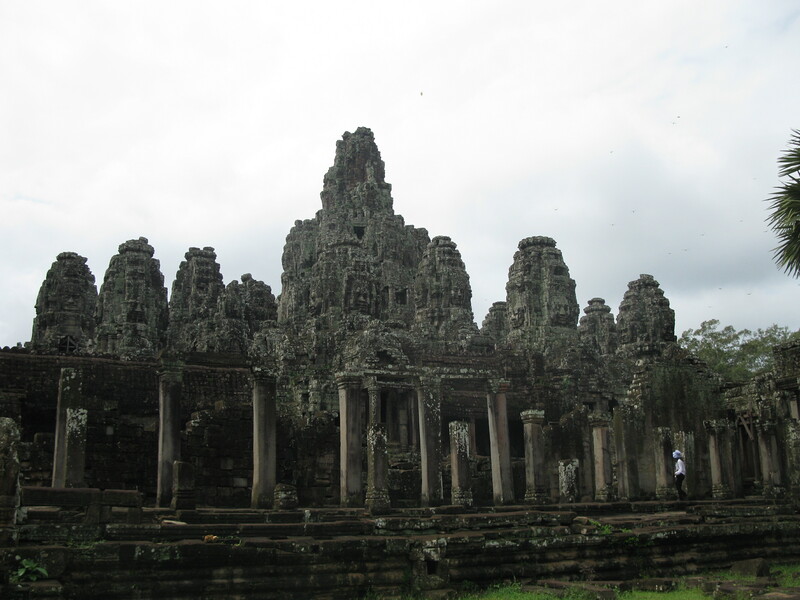 Here’s a tiny snippet of the epicness from over 1000 years ago, all built by man, stone on stone, without mortar. 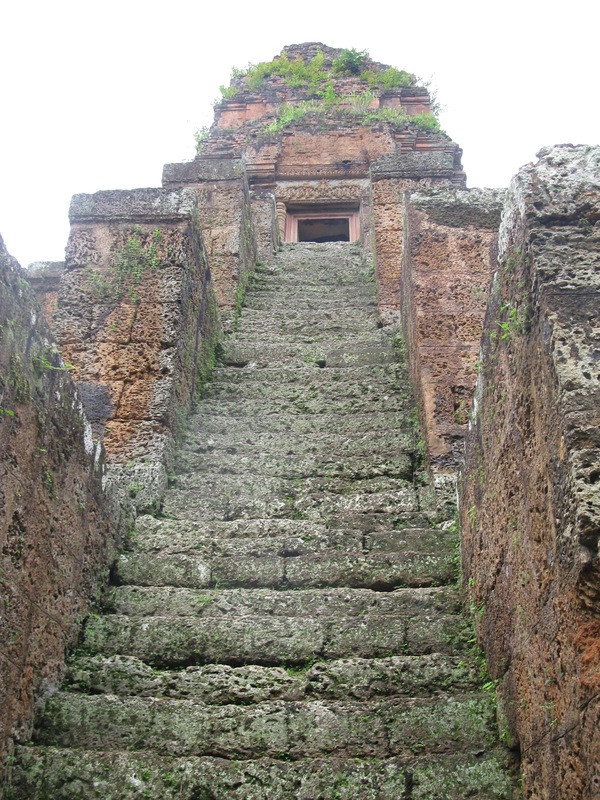 These stairs are 75 degrees to make you humble. CRAZY climb. We are now on the way to Timor Leste via Singapore. 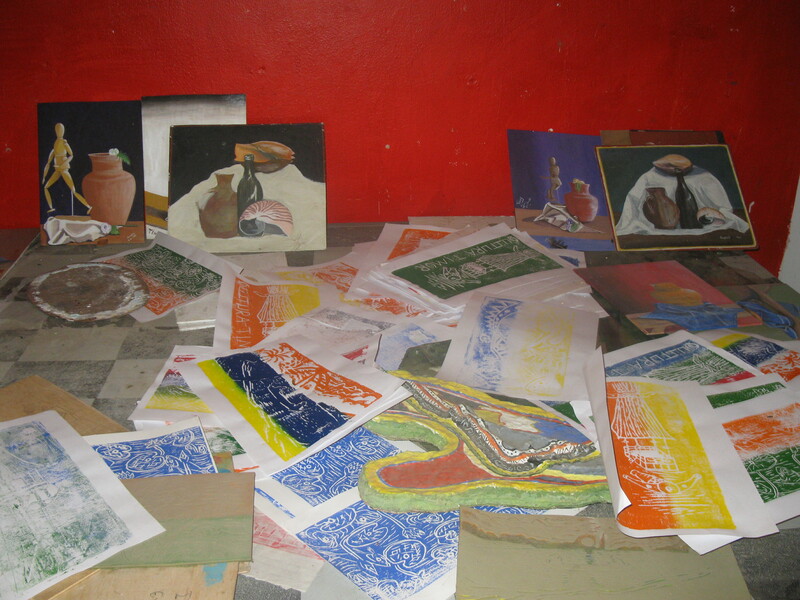 We’ll be posting the evening after we start workshops and concerts, coming up. Stay tuned and thanks for all of your support and positive thoughts, we feel them! 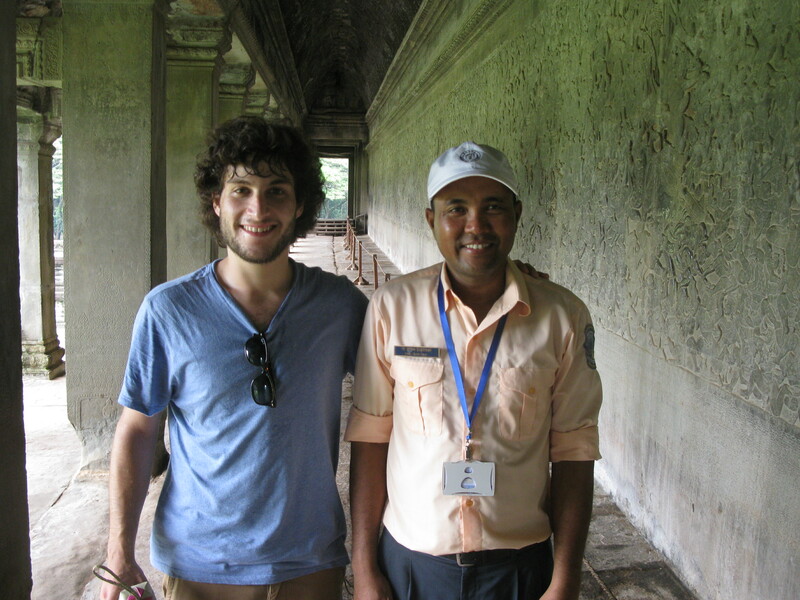 Note from Stash: Eric and I visited the very powerful Tuoll Sleng Prison and The Khmer Rouge Killing Fields just outside of Phnom Penh. This was definitely a real experience and I encourage anybody and everybody to read about what happened between 1975 and 1979 in Cambodia. Today was a fun final day of work here in Phnom Penh. It’s been a huge success, especially considering that the embassy coordinated all our workshops and concerts within about one week’s notice. 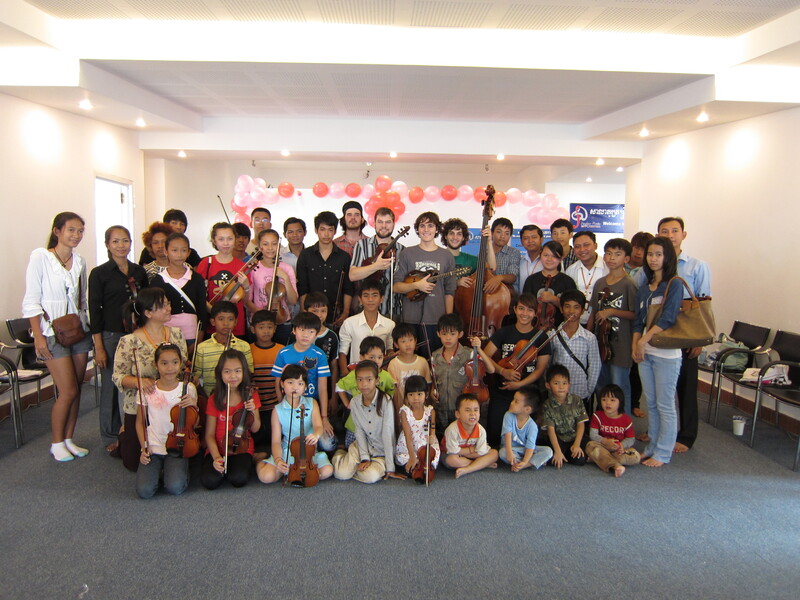 We played our final workshop this morning at the Angkor Music school for a class of about 40 students and some of their parents. The majority were violin students, and also included one bass student for Sam. Andy led the class through some chopping and a beautiful symphonic version of “bile them cabbage down.” I must admit that I was particularly tired this morning and I want to thank Michelle from the embassy here bringing some extra coffee in to the school. Even though it took some time to wake up, the good dose of cute kids, coffee, and singing “BILE THEM CABBAGE DOWN BOYS, MAKE THEM BISCUITS BROWN BOYS” forty times at the top of my lungs definitely got the nerves reacting again. Ay ay ay! 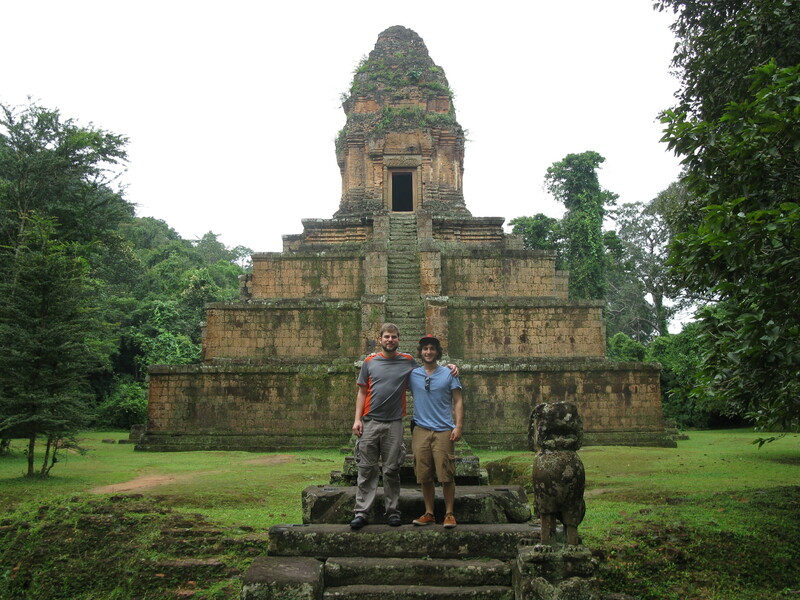 Andy and Sam took a plane today to Siem reap, the former capital of Cambodia. 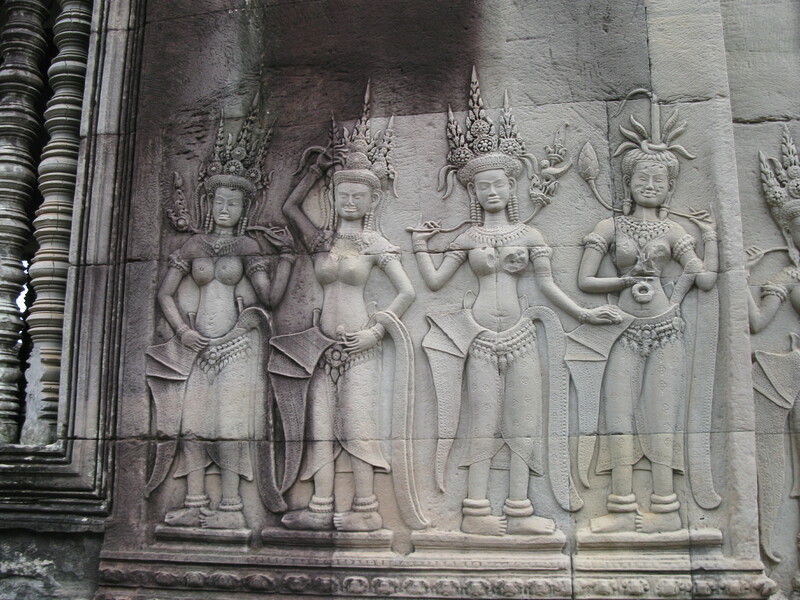 Only a few miles north of Siem Reap is the epic Temple complex known as Angkor Wat built for the King of Cambodia in the 12th century (!). I can’t wait to see some awesome pictures when they get back tomorrow and I’m sure they’ll have a whole set of wild stories. After they took off, Eric and I went on a tuk tuk ride around the city playing music for a webcast program called the “tuk tuk sessions.” It combines scenes from the colorful streets of cambodia with music and the cozy vibe of a tuk tuk. We’ll post the video as soon as it’s released! Thanks to Dustin for helping us out and filming and of course Michelle from the Embassy for holding our instrument cases on the Tuk Tuk. 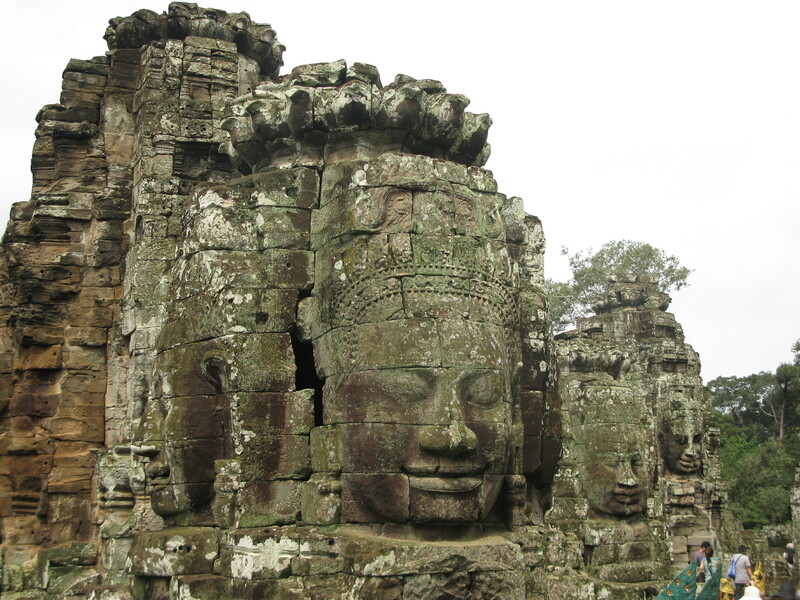 Eric here- Busy busy busy in Cambodia today folks! 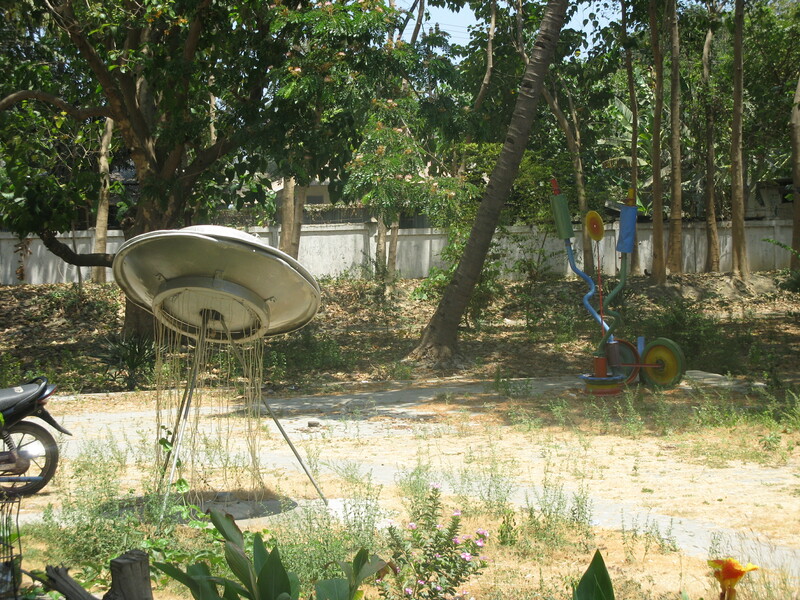 We started out with an early morning visit to Mith Samlanh- a center for street children. The raw energy and enthusiasm of the kids was incredible and infectious. After we played a couple of lively old-time tunes, Stash and I jumped off stage to demonstrate the instrument roles while Andy and Sam held down the groove. They quickly started thumping the bass notes with their feet and pitter-pattering fiddle melodies on their chests, clapping on mandolin chops and playing air guitar- screaming wildly the whole time. Even though is was a fairly short set, it’s safe to say that by the end we were all the most exhausted we’ve been after anything on the tour so far! Truly rewarding experience- video below! A short rest and some lunch at the hotel, and then we were off to Cambodian Living Arts for an intimate musical exchange with some AMAZING traditional Cambodian musicians between the ages of 18 and 22. These guys were straight killin’. I was immediately excited when the first musician walked in with a “bangjo”, which was like a mix between an asian lute, banjo, and mandolin. 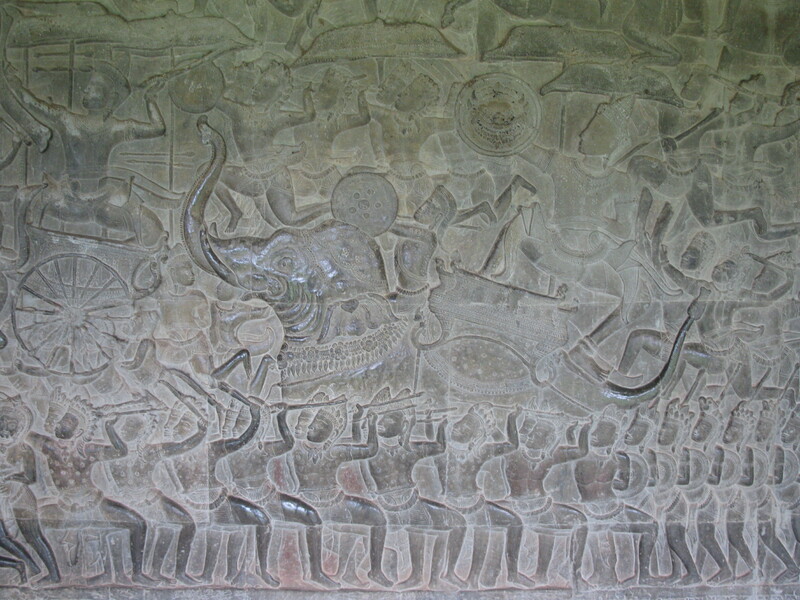 Then poured in the “tro”, “thon”, “khim”, and “roneat thung”, which are basically fiddle, drum, hammered dulcimer, and xylophone. They played for us, we played for them. Everybody was stoked. 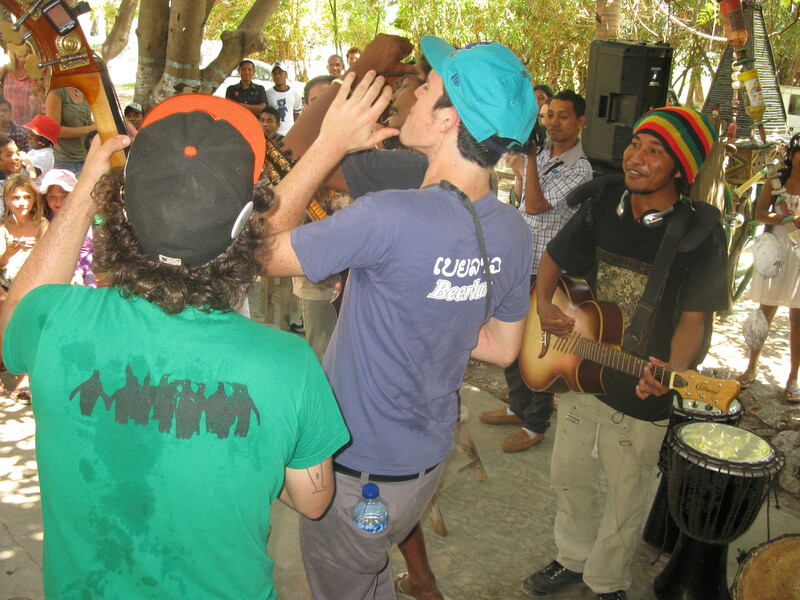 Then the jamming commenced- we learned some beautiful cambodian tunes and taught some traditional American music. 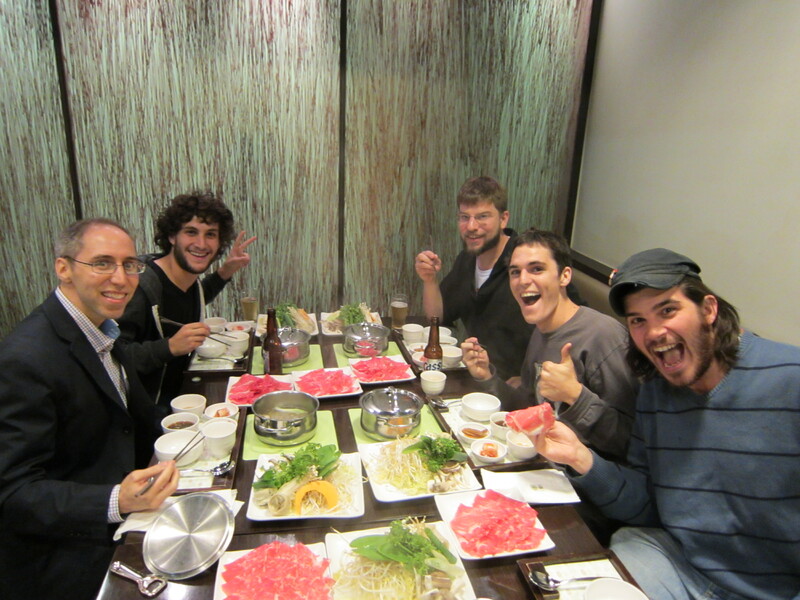 We also taught them “Stingray Stew”- which is a comprised of music we heard in Laos that we put to an old time groove. 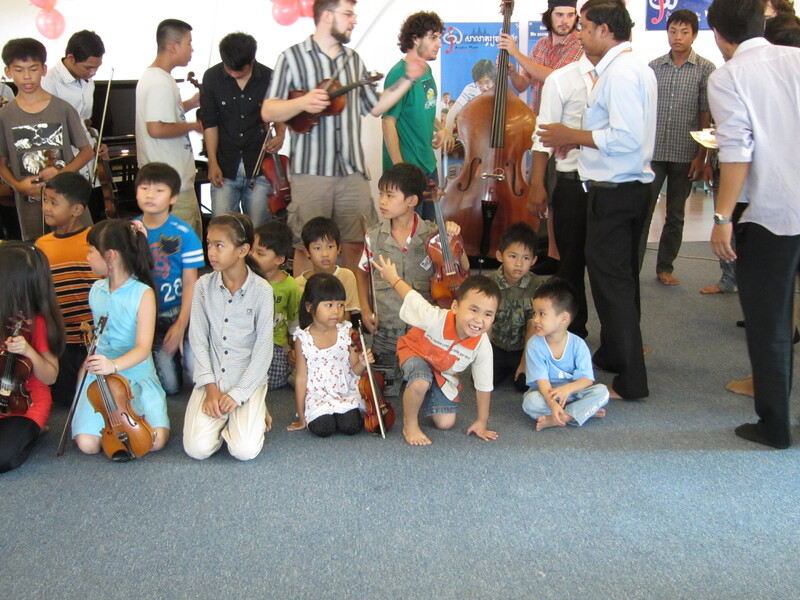 So we played Lao melodies to an American groove with Cambodian musicians. Now THAT is what I call an Earth String Band. We ended the night with a concert on the street- check it out!